Banana is a life saver, i know every house-hold must have at least 1 or 2 on their fruit bowl. I usually have a banana, whenever i feel low on energy or moody. Do you know it has a component called serotonin? that enhances your mood. Next time, if you feel low, try a banana, might bring a smile on your face. Apart from that, they add good volume to your smoothies and also acts as a natural sweetener. 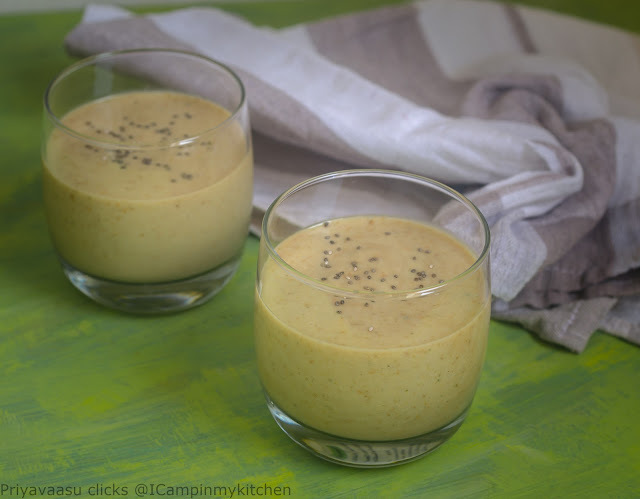 Today i bring you a healthy and refreshing smoothie with banana and figs. Writing about figs, My sister, has a huge fig tree in their apartment compound and all the families there, enjoy fresh figs, whenever they want. I feel so jealous, when i think about it, nothing like plucking a fruit straight from the tree and munching it. The freshness and so organic, no pesticide, no sprays, wow, i feel so J!!! It is a fruit from middle-east and all these days i didn't even know how to pick right figs, such a bummer na! Recently i learnt, how to buy fresh figs. Fresh figs are very delicate and they don't stay good for long, their life-time is only 2 or 3 days, so if buying fresh figs look for that deep color and tender skin. If buying unripened ones, let them stay on the counter till they ripe, then store in the fridge and consume it within 2 or 3 days. Dried figs are available all year around, and are very easy to store. Figs are well known for their health benefits. They are good in dietary fibres, potassium and good gut bacteria. The next simplest form they can be enjoyed is in smoothies, blend them with milk and serve immediately you have yumm smoothie, to rev you up for the day. I had it today after my yoga workout and felt so good. Take chopped banana and fig in a blender jar. Add 1 cup of milk and blend until smooth. Add remaining milk and blend again. Pour in glasses, sprinkle chia seeds on top. Serve immediately. the smoothie is a total energy booster. Why wouldn't I love this! Banana is always there in my pantry and I was so upset that I didn't notice I ran out of them today... hehe... Delicious smoothie! Excellent choice of fresh figs. I should also get them. My kids are fond of smoothies and so this would be a great choice. We don't get fresh figs here, and even if we get, the price is too high. Your smoothie has turned out very nice. I can imagine how delicious it might be.. This is one filling smoothie,perfect for breakfast..
That is one healthy and tasty dose of smoothie. 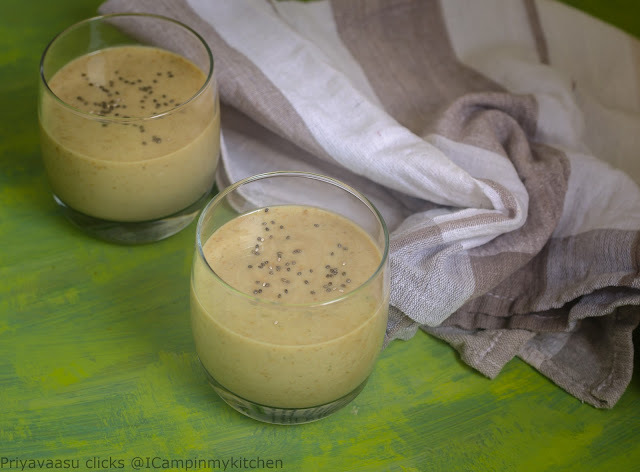 My kind of smoothie, adding fig is definitely a super healthy option to feed kids easily. Lovely. I got tons of fig from my friend. I just sun dried them and kept it.. this is great idea to add them in smoothie. love it. Such a hearty smoothie. Loved the way you added figs and banana in this one! Lovely smoothie. My uncle had a huge tree called atti haanu, they are like figs but smaller I loved going to his place as my breakfast and lunch and dinner( if allowed) was these fruits. Now I know what I need to pick up for my breakfast but then that is when I next visit the market. Fresh figs are just sooo delicious, right Priya. 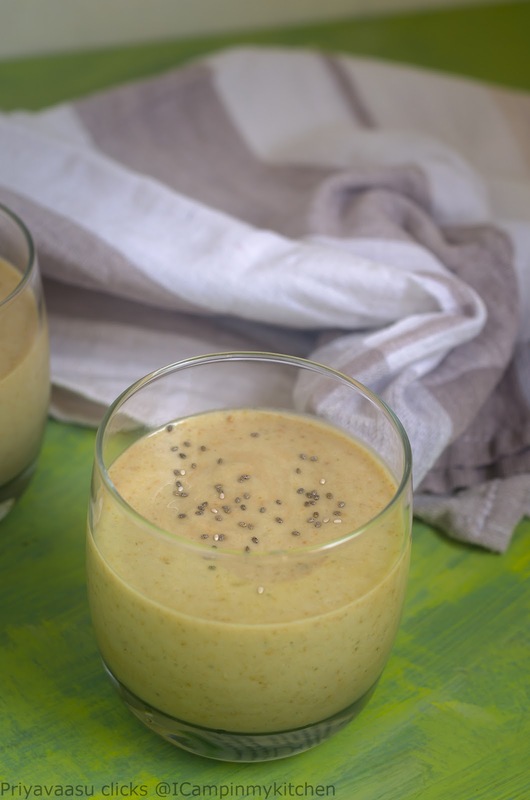 Love this banana fig smoothie. I have never used fresh figs . The combination sounds amazing. Lovely clicks and this one sounds so good and must try!..